When my very first cesta de navidad arrived, wrapped up in cellophane and emblazoned with Corte Inglés publicity, I excitedly ripped open the top of the box and dug out the contents of the box. I was literally a kid on Christmas morning, just three weeks early. Many companies and organizations give pre-packaged Christmas baskets to their employees during the holiday. They’re also raffled off at bars and hermandades for a few euros, but they all have two things in common: edibles and booze. In my first cesta, I received four bottles of wine, one of whiskey and one of anisette, plus enough cured meat to tide me over until Easter. 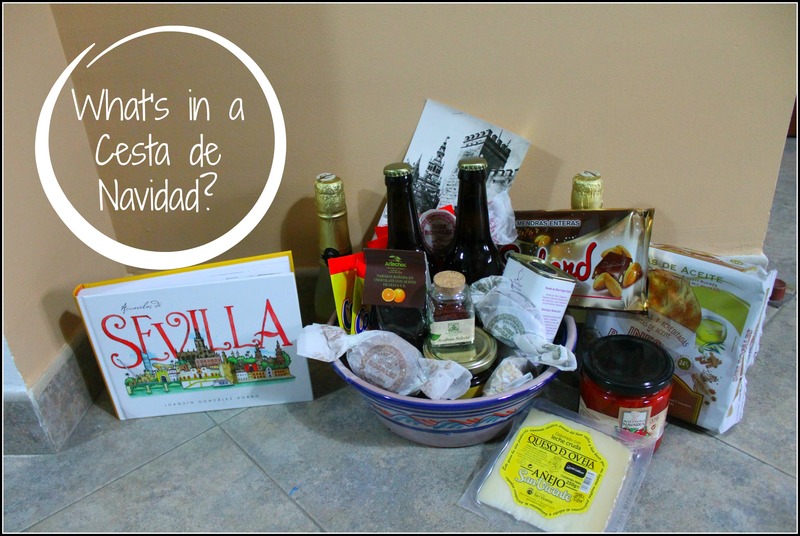 Baskets also include typical Christmas sweets, cheeses, conservas like bonito or white asparagus and an interesting brick of something called a “Christmas Broth.” Contents are neatly packed up and shipped out to the tune of anywhere from around 20€ and up to 300€! While my Christmas shopping usually consists of plane tickets to spend the holidays somewhere with my parents, this year I’ll be flying home for wedding planning. Rather than scramble for gifts amidst other scrambling shoppers, I decided to make a twist on the traditional Christmas basket by bringing my favorite and American-palatte-approved goodies home in ceramics. 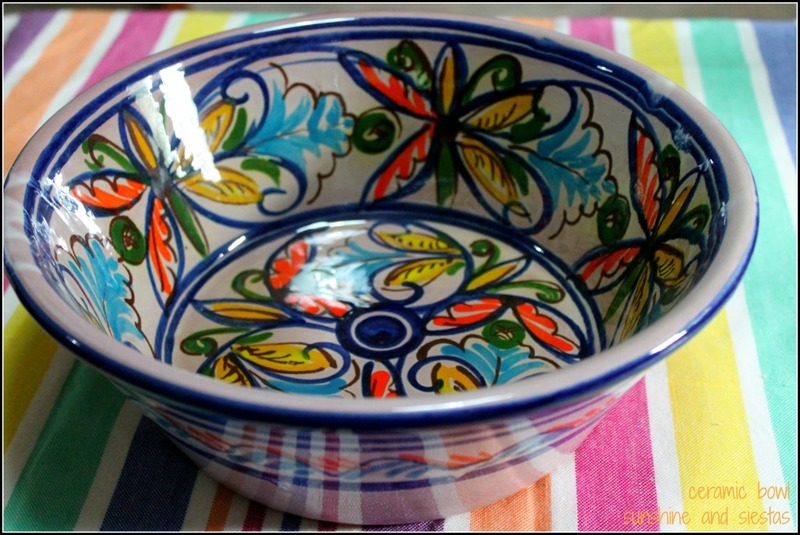 Because, really, what do you get the woman who has it all (as far as Spanish souvenirs go) and is picky? 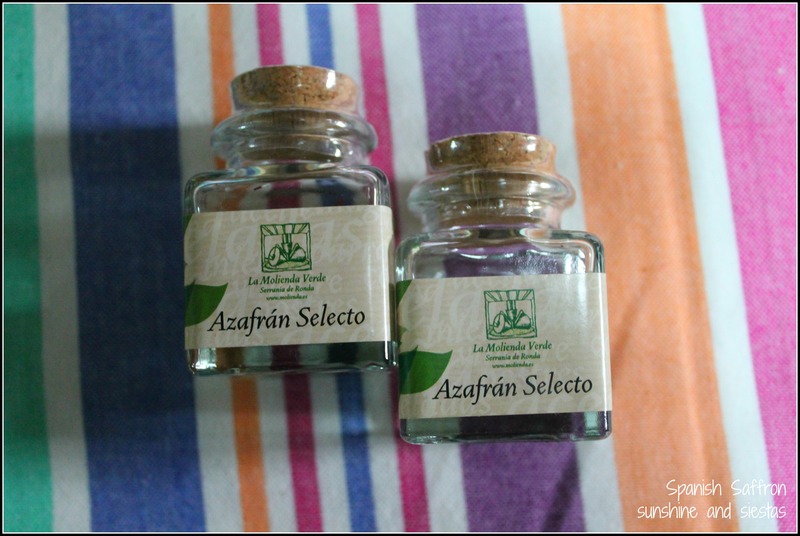 The same amount of azafrán in the US costs $16, so I was thrilled to find it wrapped up nicely! 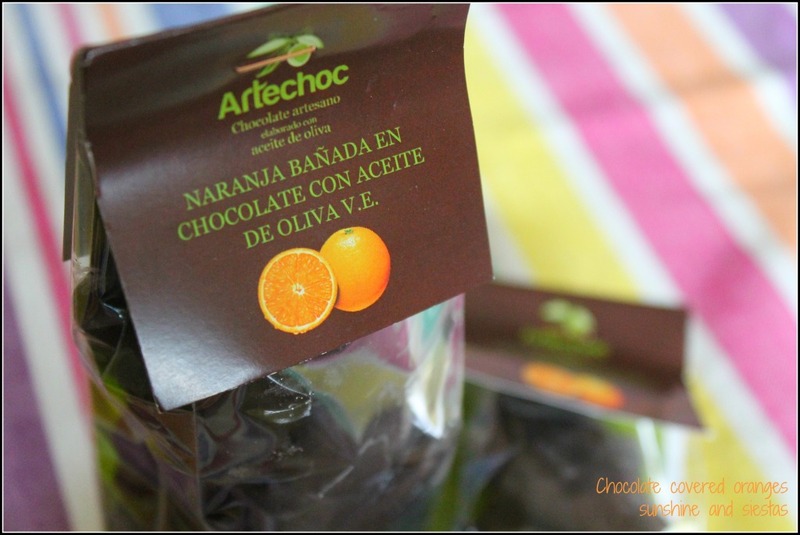 Everyone in my family but me are chocoholics, and these oranges are representative of Seville, with the olive oil giving it an appropriate amount of acidity. 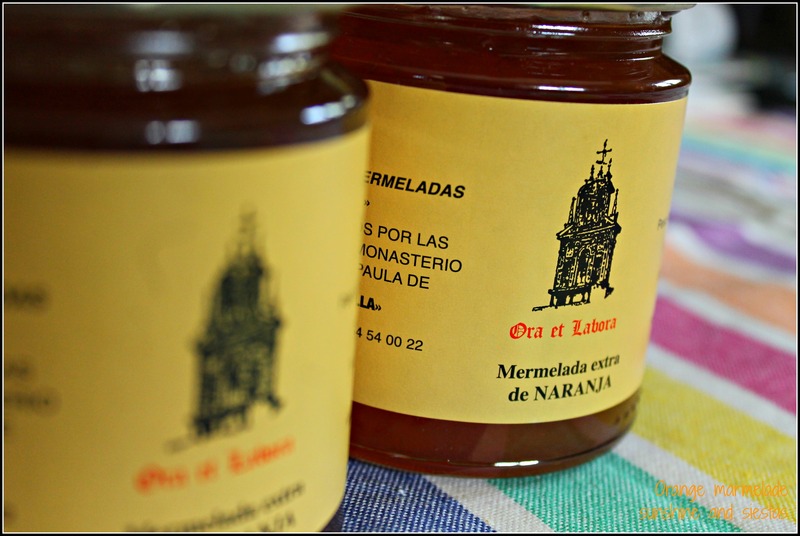 Naranjos abound in Seville, and the oranges collected from them are made into bitter orange marmalade. Nuns at the Santa Paula monastery make this particular type, and peddle it out of their turnstiles. 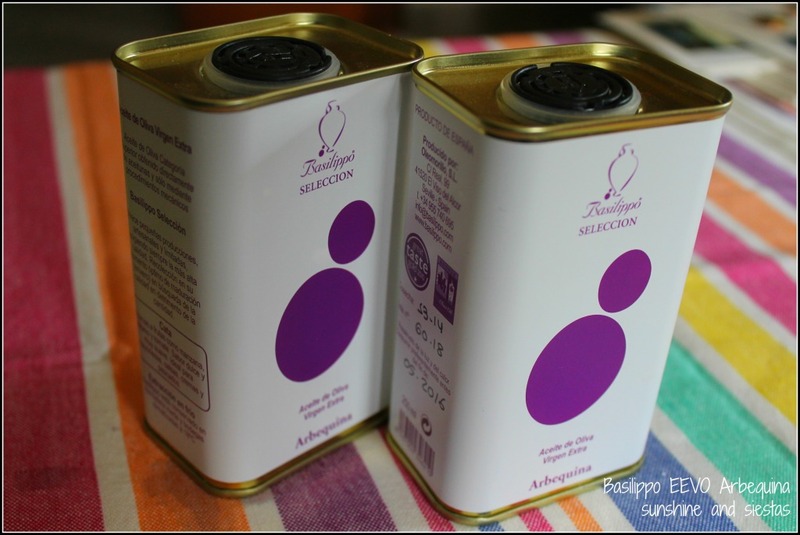 Basilippo is an award-winning brand of extra virgin olive oil planted, harvested and pressed in nearby El Viso del Alcor. The arbequina olive it’s made from is known for its suave and balanced taste. 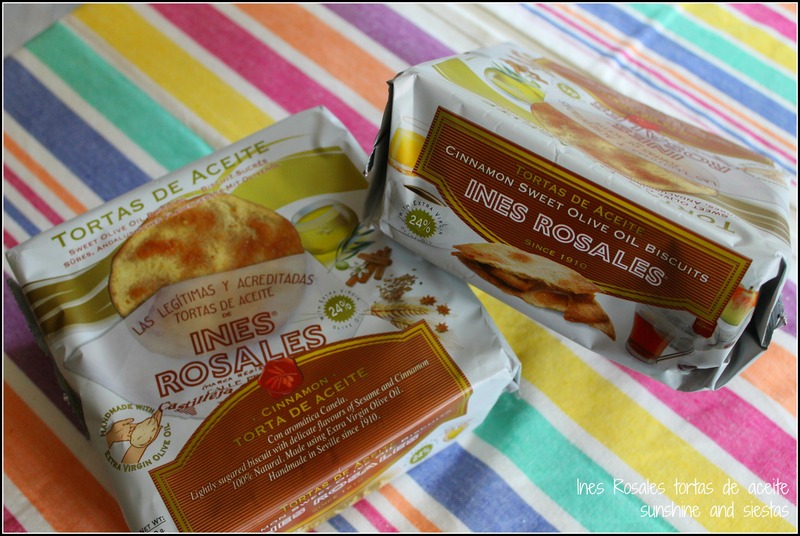 Tortas de Aceite have been around for ages, and Ines Rosales is an international superstar when it comes to producing them just outside of Seville. 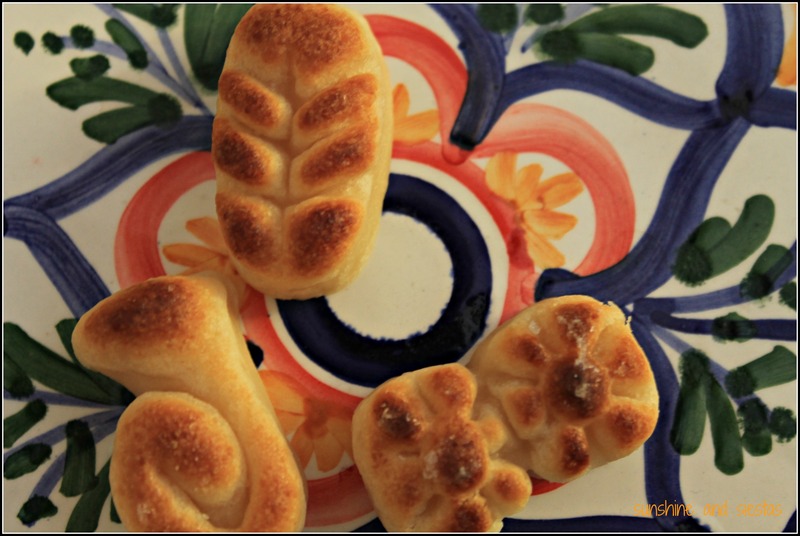 Other varieties include savory with rosemary and sea salt, or made with oranges. 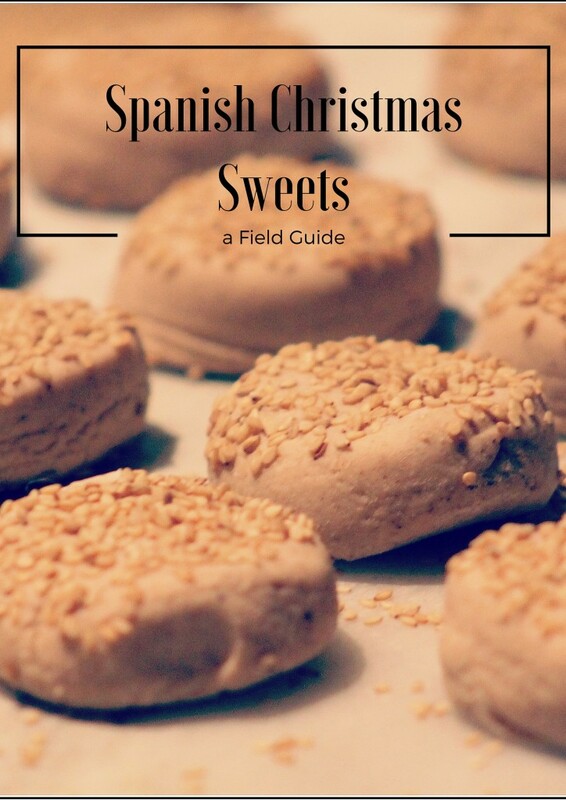 I’m not a fan of these crumbly cookies, which are ubiquitous with Christmas in Spain. 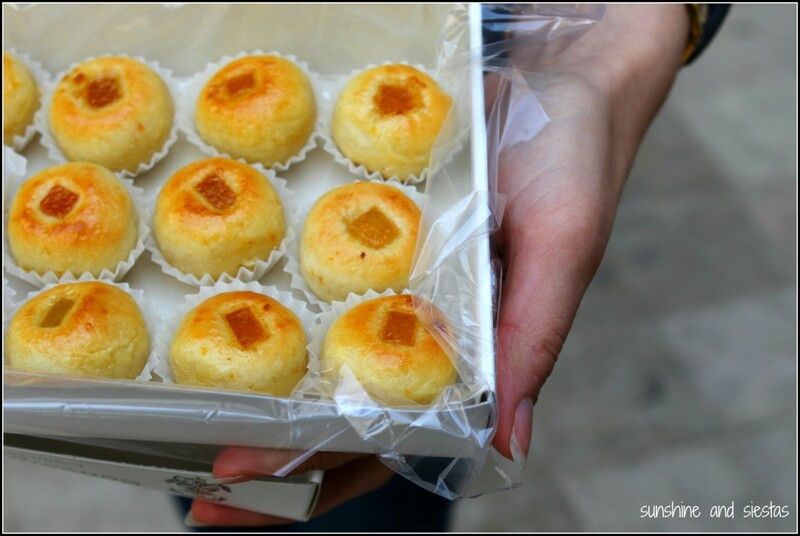 The most common version are made from manteca, or pig’s lard, which is a no-no with customs in the US. I found some piggy-free varieties at Ines Rosales. 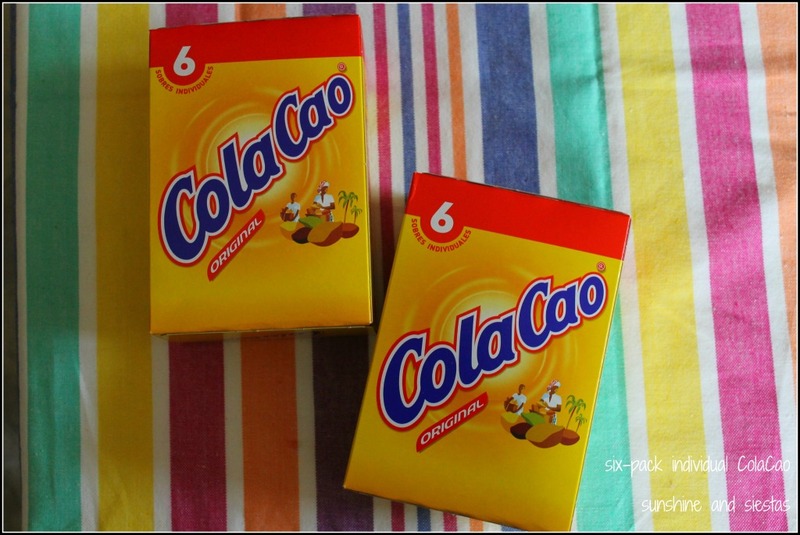 The bright yellow plastic canisters are a Spanish kitchen staple, and I love the powdery goodness of Cola Cao every Sunday with my churros. 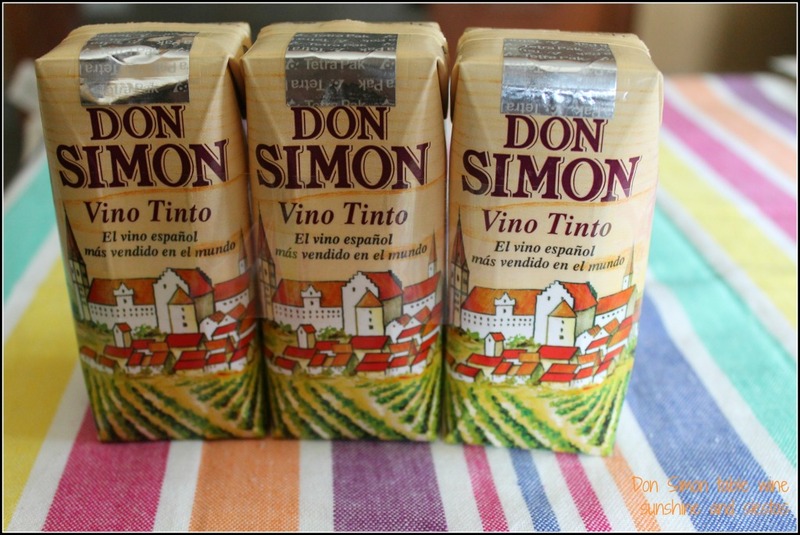 Rather than buying the canister, you can get individual packets just like at a bar. 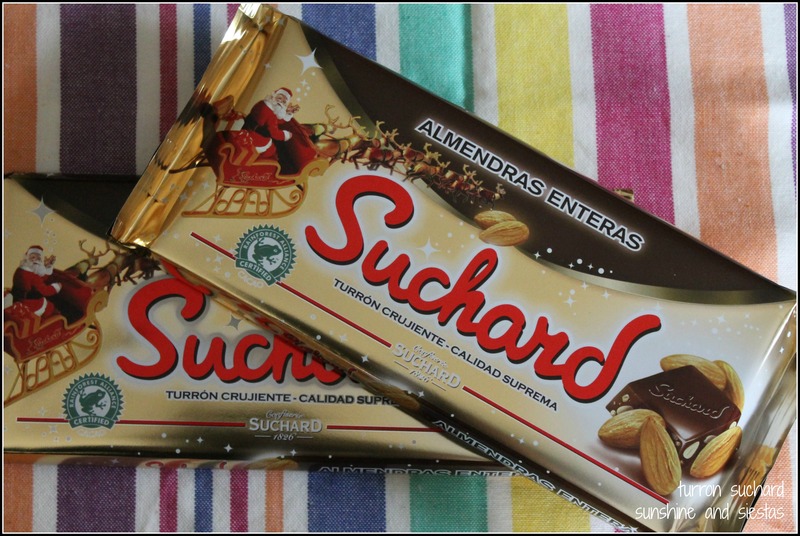 Spanish Christmas sweets let me down, but chocolate turrón is practically a gigantic candy bar. 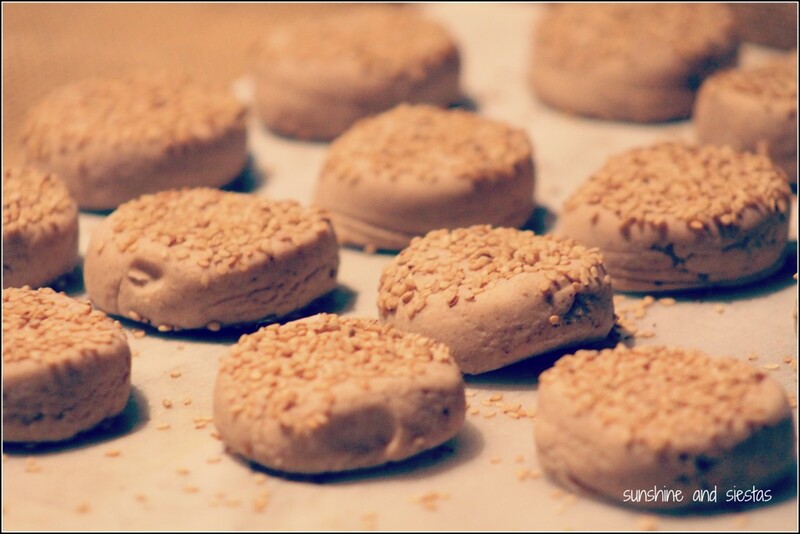 The normal stuff is nougat, made only with sugar, egg whites and honey. 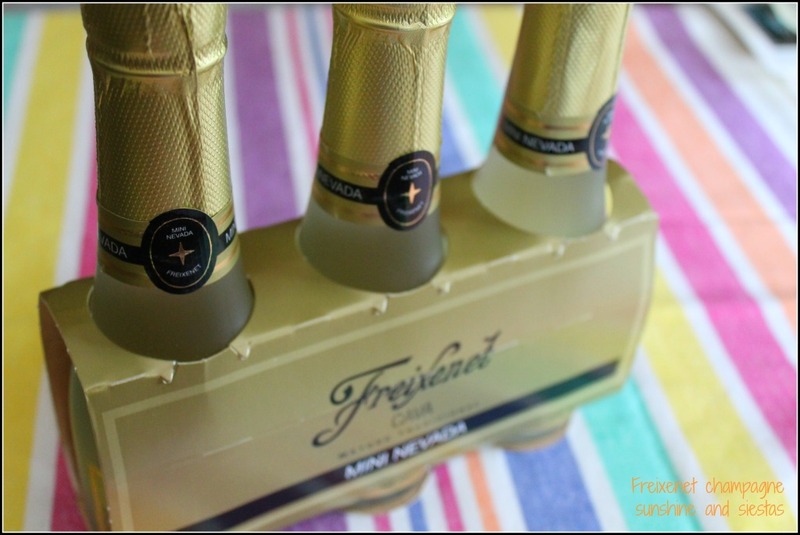 These small bottles of cava are festive and perfect for toasting the new year at midnight on New Year’s Eve. And they’re easy to carry and open! I’m the only wine drinker in my family, so these miniature tetras are for novelty more than anything! Plus, customs is getting stricter on how much alcohol you can bring back, and it must be claimed on your customs form. 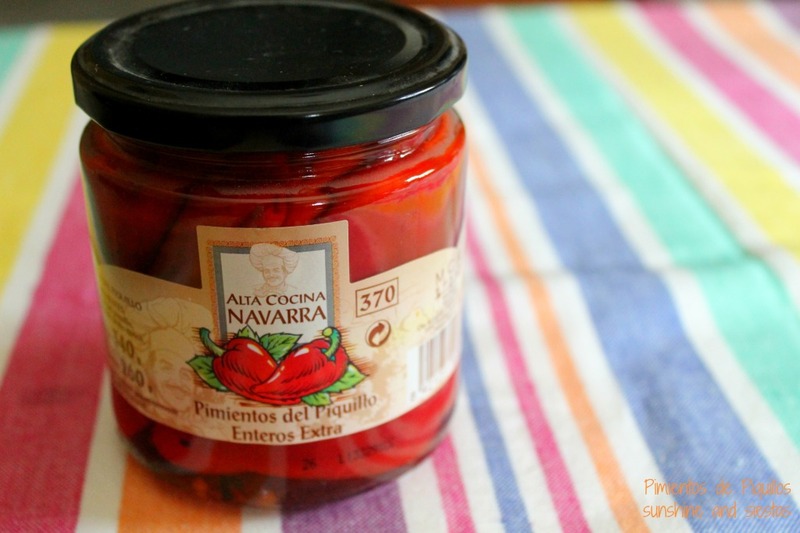 For whatever reason, I thought that pimientos de piquillo would make a good gift for a dad who loves to experiment with recipes. If all else fails, I don’t think they’ll go bad any time soon! 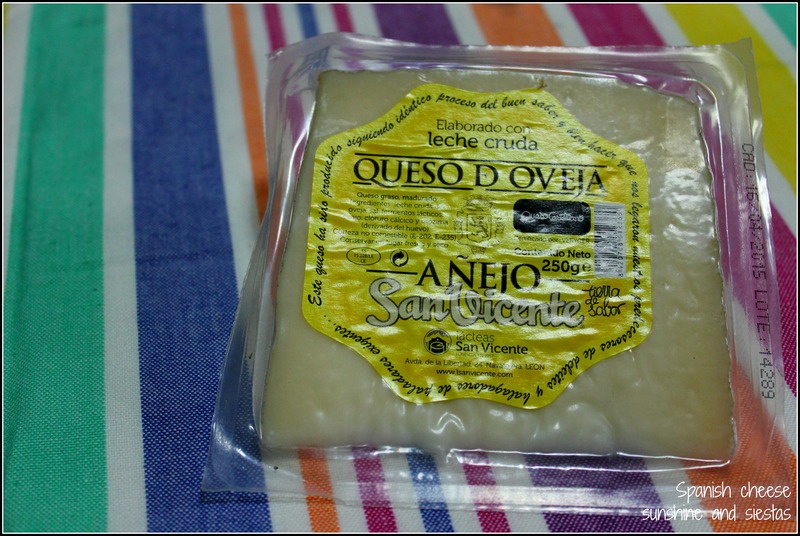 Meats are a big no with customs, but hard and semi-hard cheeses are totally fine. My sister loves any sort of stinky cheeses, and this is one gift I’m glad to get in on! 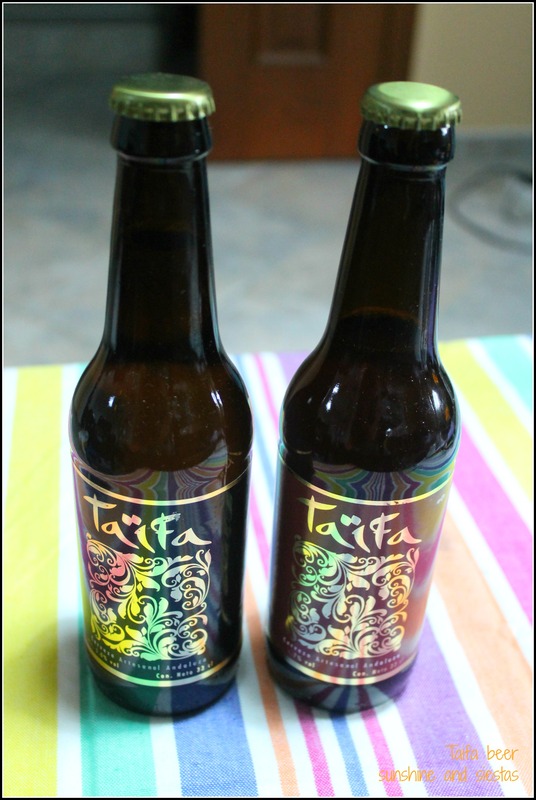 My family members are big beer drinkers, so I picked up some local Taïfa cervezas from the Mercado de Triana. 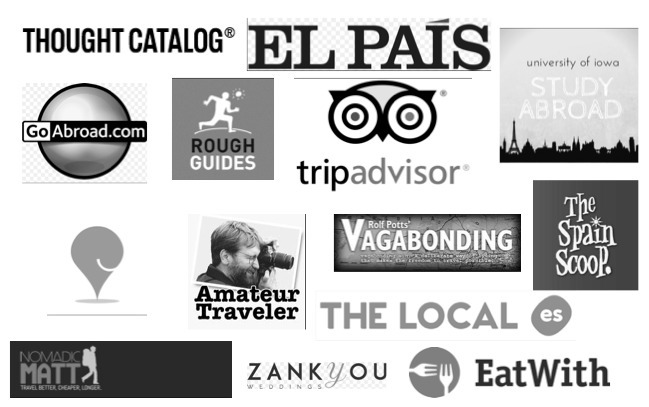 Thankfully, craft beer is catching on in Seville, and these varieties are palate pleasers. All that extra weight cost me 50.05€ for each cesta. 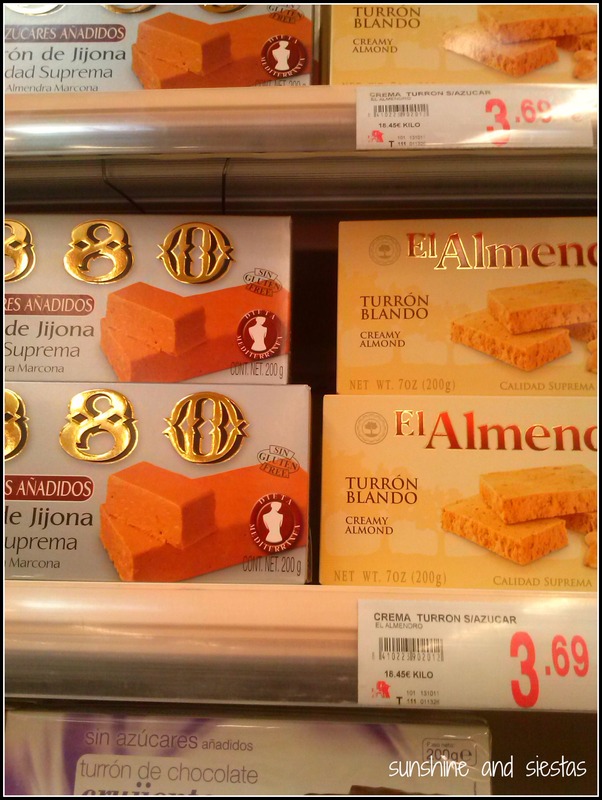 I added little touches of things I’d known would be hits, such as black-and-white old photos of Seville for my parents, a tub of Nutella for my sister (not Spanish, but what everyone equates with European snack food) and a Spanish heavy metal CD for my brother-in-law. Noticeably absent are the meats, the fish and the olives, but why transport things home that could get me in trouble with customs, or go uneaten? 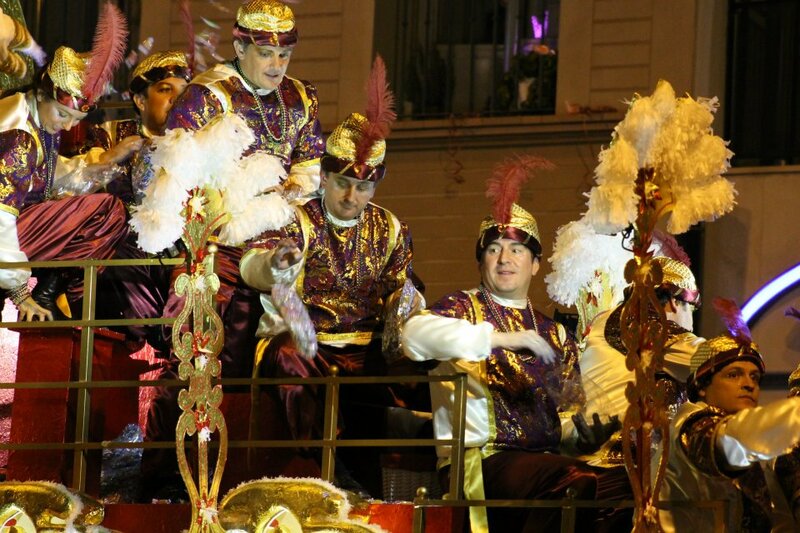 If you’ve ever dreamed of candy rain (circa the Candy Coated Raindrops song from the 90s), you have a date with destiny on January 6th: The Cabalgata de los Reyes Magos. 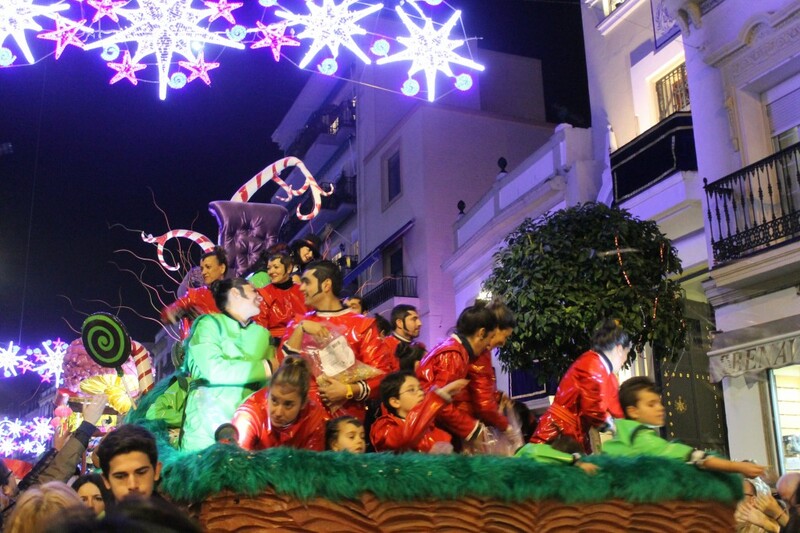 The Three Kings Epiphany parade has got to be one of the goofiest but most beloved traditions for the expat community in Spain, where enormous floats laden with kids pelt candy and small, plastic toys at bystanders (and if you’re lucky, 100 grams of the good jamón). There is hardly a trace of Santa Claus in Spain, as children believe that they receive their toys from the Three Kings who brought the Baby Jesus his gold, frankincense and mirth. 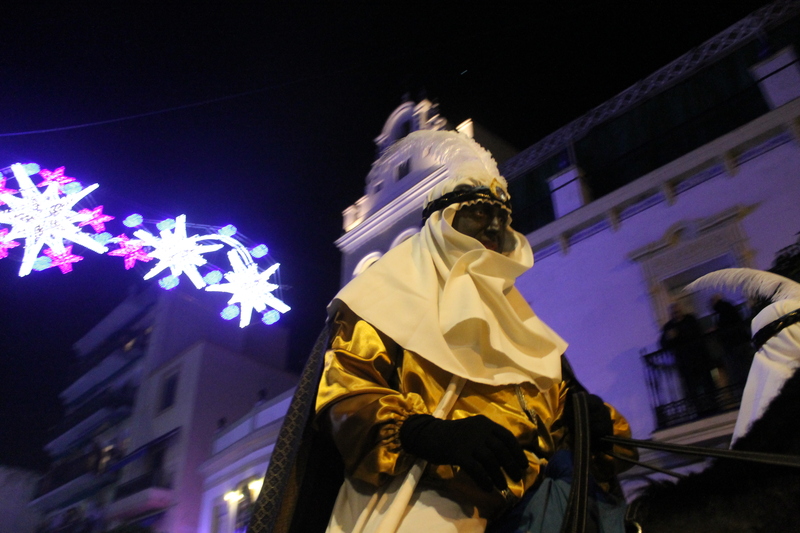 Coming from the Orient by camel, Gaspar, Melchor and Balthasar parade through the city on the eve of the Epiphany. 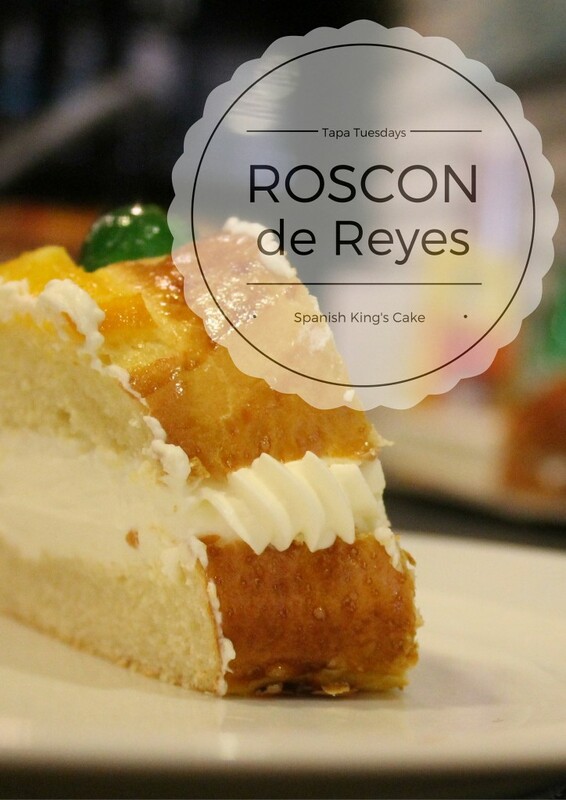 After binging on Christmas sweets, families then gather to eat Roscón de Reyes, a flaky fruitcake laced with whipped cream. I usually stick with a gin and tonic and ride out the candy storm, venturing out with an overturned umbrella to catch a few sweets for me and the Novio. 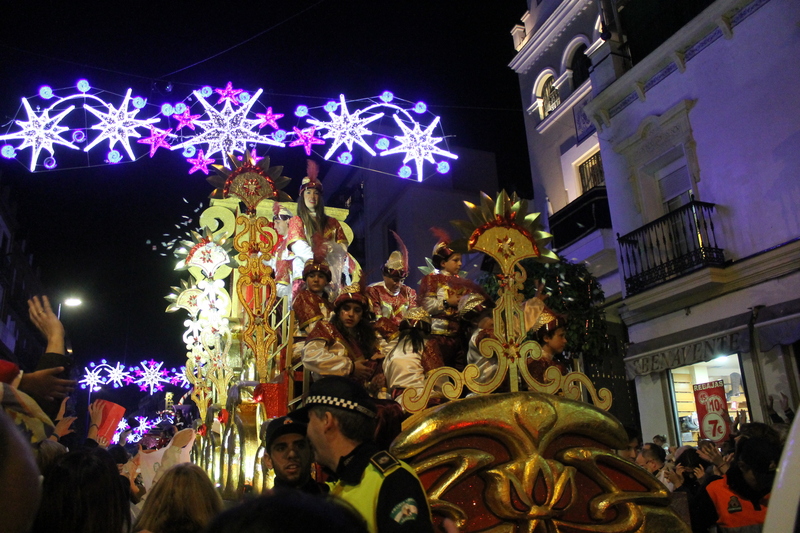 If you’re interested, the Cabalgata through Triana begins at 5p.m. this evening, a day later than normal. You can find the schedule here. Want more? 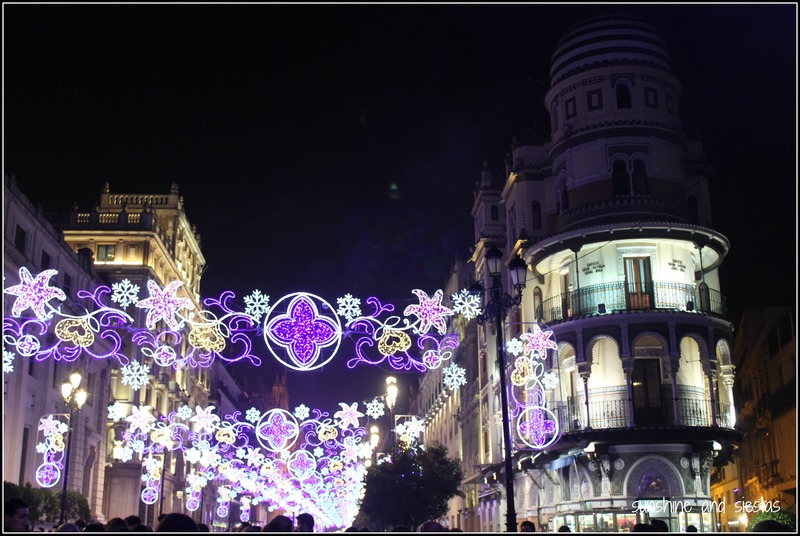 I wrote about Triana’s cabalgata last year, when my friends convinced me, on a candy binge, that it was a good idea to stay out until 6am. Jerks. Seville is the type of gal who doesn’t really need to get gussied up – she’s stunning enough on her own. But La Hispalense (she even has a fancy name) loves to gets glitzy at Christmas time. 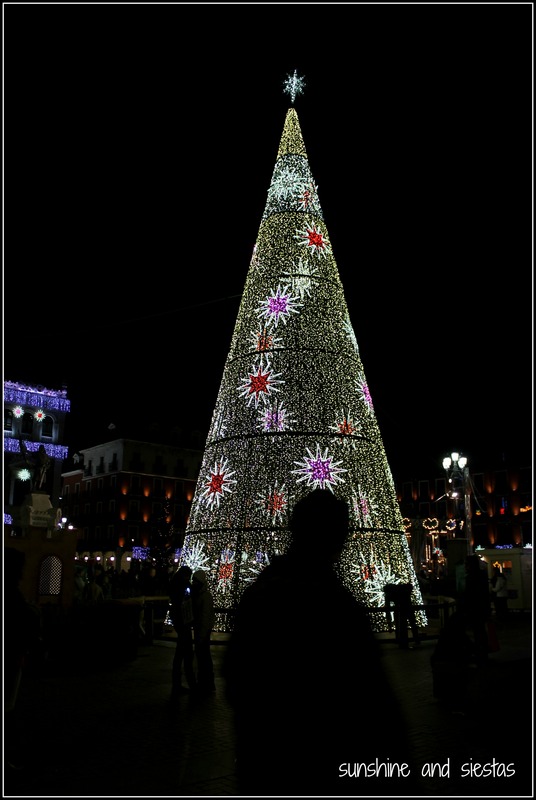 As soon as the long December weekend beings, the city center is bursting with shoppers, a number of handicrafts markets pop up in Plaza Nueva and the Alameda, and police controls tighten up, thanks to the number of merry markers drinking at all hours of the day. 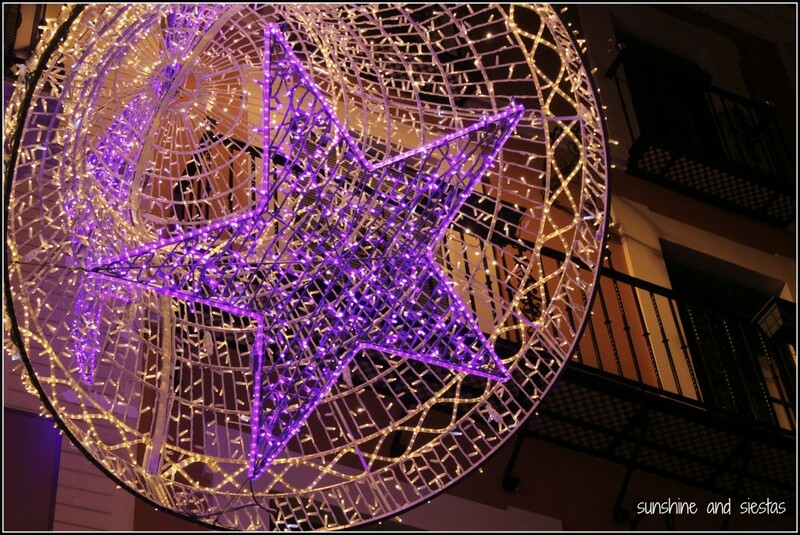 But as soon as the lights are turned on, I feel like Christmas really begins. 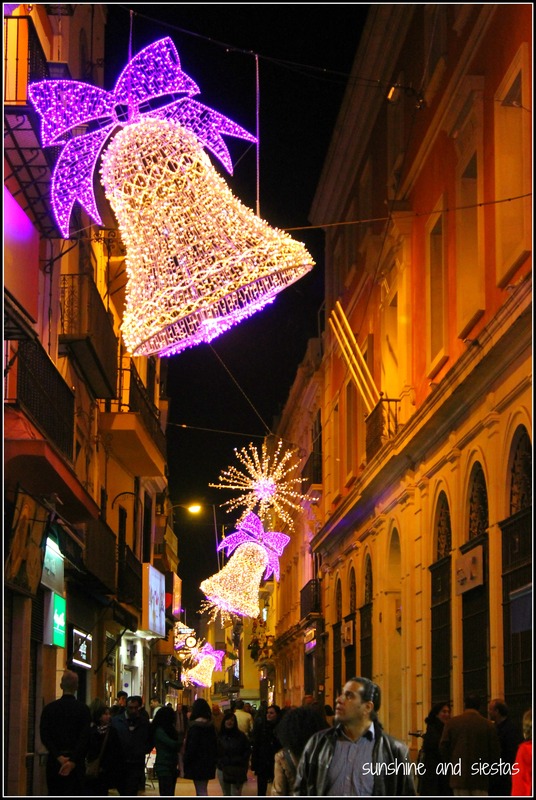 This year the city has used LED lights to dress up the city’s biggest thoroughfares – Constitución, San Fernando, around the Encarnación – and even in the outlying neighborhoods. Dios, even the Alcampo next door is decked out in holiday style. Once again, the 3-D mapping on the eastern facade of city hall is operating. 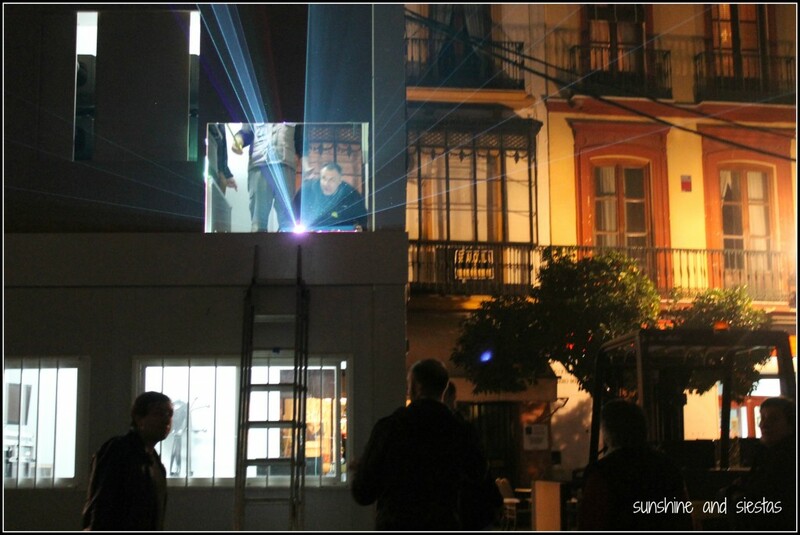 According to Fiona of Scribbler in Seville, the light and music show that’s projected onto the building won an award last year. 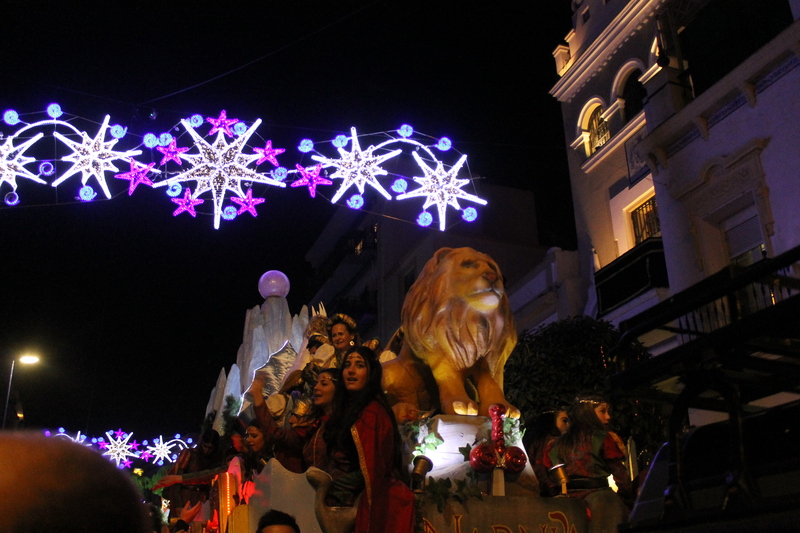 This season’s show, El Espíritu de la Navidad, will be played from dusk until 11 or 12pm on the hour until the Epiphany Day. 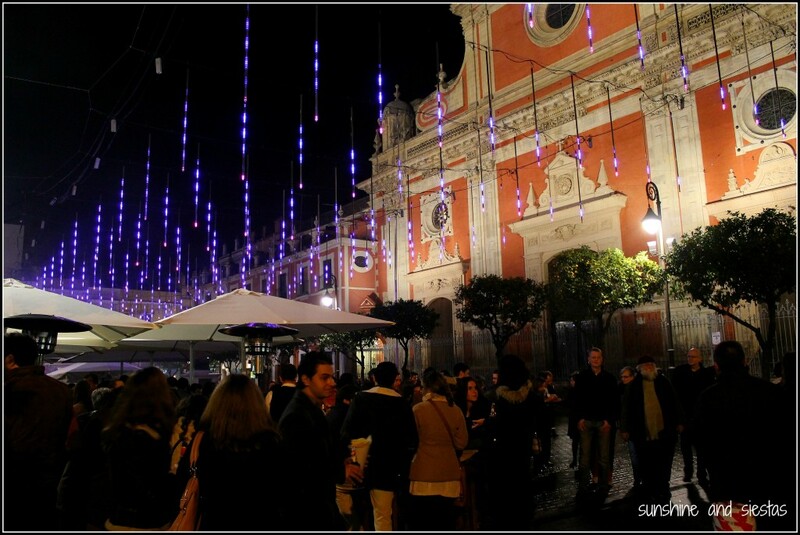 How does your city celebrate Christmas? 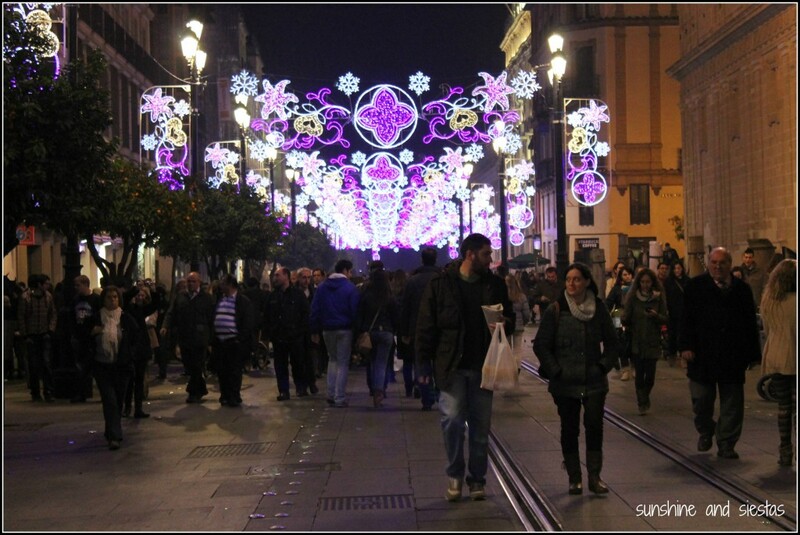 Where are your favorite lights in Seville located? Not too many years ago, I asked my high school students what the Reyes Magos had brought them. In the midst of a financial crisis, I was shocked to hear they received computers, souped up cell phones and other goodies. 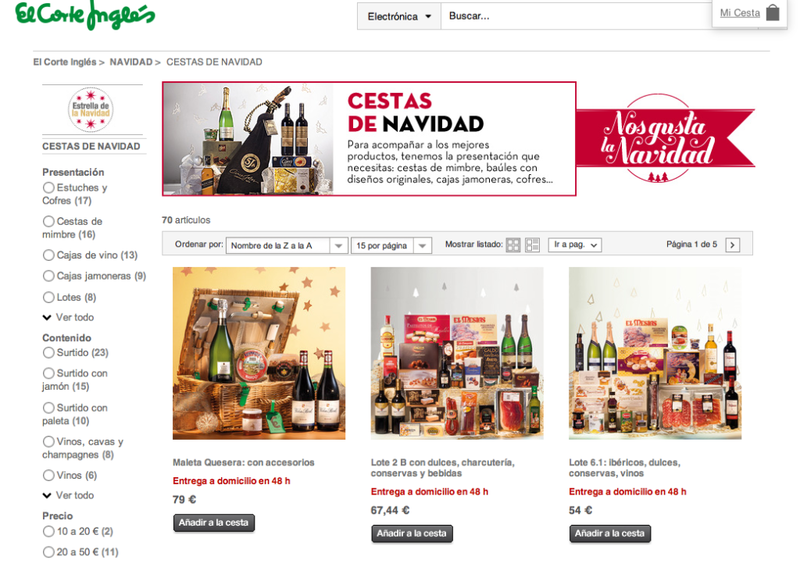 After all, Santa Claus and his team of reindeer don’t have any Spanish children on their list because Spaniards have the tradition of the Reyes Magos, or the Three Wise Men of the Orient. They roll into town on big floats, called carrozas, and Melchor, Gaspar and Balthasar pelt everyone from the little kiddies to the abuelitas who elbow you out of the way with hard candy and small gifts. I usually watch the floats on Calle San Jacinto from the refuge of Java Cafe, occassionally venturing into the crowd-choked streets for a better view or a few pieces of candy that have fallen between hands, bags and upturned umbrellas and onto the ground. This year, as the Novio is still away, I watched the city parade and its 30 floats from the front row with some friends. Grabbing candy off the sides of floats, I nearly got my head taken off by the parade of horses, brass bands and floats as my shoes became sticking from the crushed candy under them. I took loads of great pictured from right in the front, but I can’t seem to get them off of my camera! No worries, I’ve got fistfuls of caramelos! 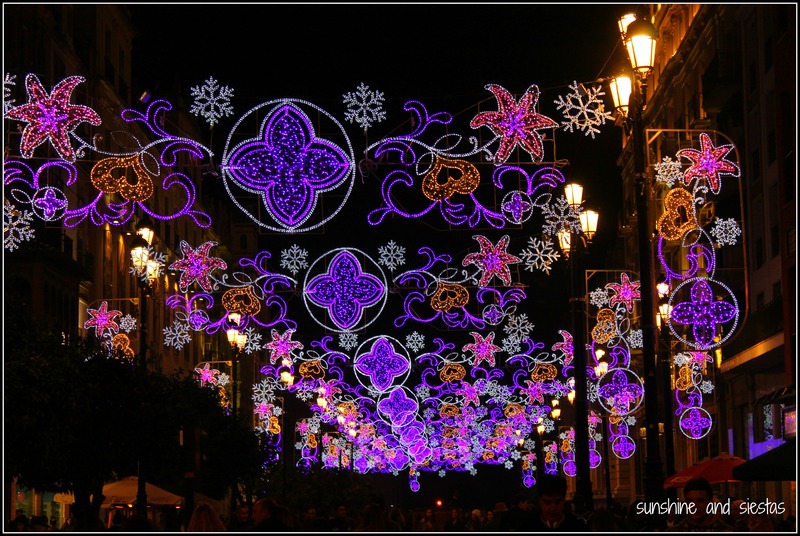 Got a photo of Seville or Southern Spain to share? I’d love to see it! Send me the photo, along with a short description of where you took it and links to any pages you’d like included, to sunshineandsiestas [at] gmail [dot] come. 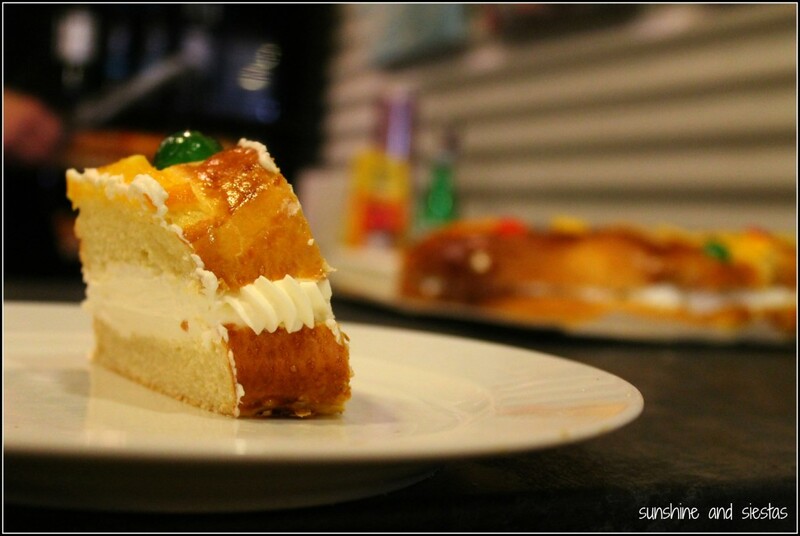 Look for a new photos every Monday, or join me at my Facebook page for more scoop on El Sur! 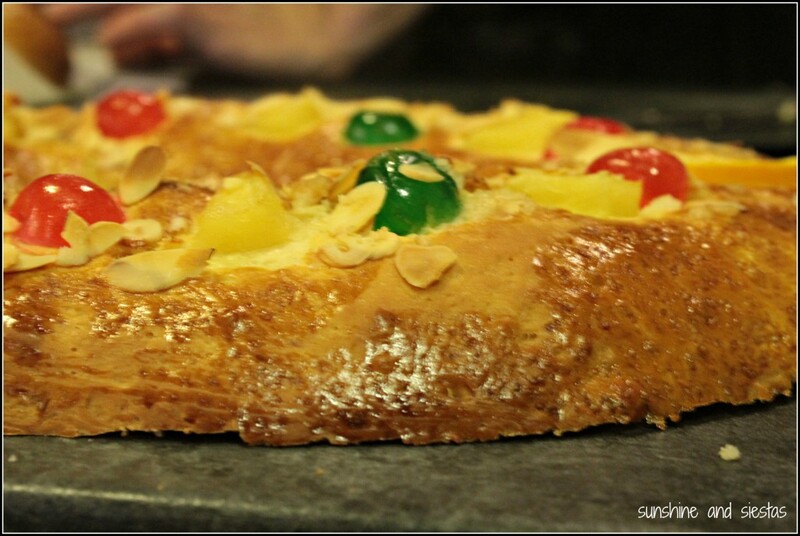 What’s your favorite Spanish holiday tradition?